Beautiful! You totally "get" the desert. It is such a special place and we missed it terribly, when we lived somewhere else. It speaks to me, to my heart, to my soul. Living in the desert made us better people. It helped us to see the beauty in the "little" things and appreciate and value simplicity. Just a few raindrops is all the desert needs to come back to life ... It is a place that you either love or hate, there is no getting used to the desert. You either belong here or you don't! Thank you Steve for sharing your thoughts! Sure looks like nice and toasty weather. I've never really been to the desert, but I think my Oregon blood might shrivel in the heat. And thanks for the ear worm too. 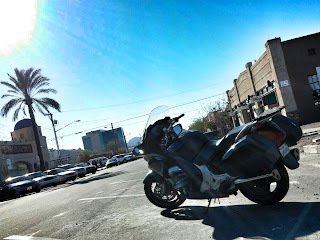 I have not ridden very much at all in desert areas (although some consider West Texas a desert :) ) I have heard people talk about riding in the desert, but it never appealed to me. Reading this post has made me reconsider. I need to check it out for myself sometime. I fell in love with the desert the first time (of many) I visited Phoenix. And, I agree, Tucson is even better. But I'm smart enough to know that I would wither during the summer heat, so for now I'm quite content to visit on occasion - preferably in the spring or fall. But it is certainly beautiful country. The desert seems like a fun ride. I might give a visit to phoenix one of these days. Great pics.